As I am writing this blog, I am working with Tobias Beckwith on honing my craft. Tobias, who has become a great friend, was on the production and management teams for several Broadway productions such as, The Fantasticks, Sweeney Todd, Oh! Calcutta! and has directed, produced and managed shows for many famous magicians for the past 20 years. With Tobias’ expertise, I am learning to be a more dynamic performer, better story teller and to create more engaging routines for my audiences. I believe that I am always a student, always striving to be the best at what I do, to make better choices and to never stop learning. Speaking about doing your best, I’ve got to brag a bit here. 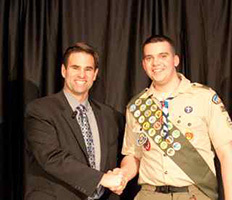 My son, Scott, who turned 18 last October became an Eagle Scout. This is the highest rank in Boy Scouts. Only 4% of boys scouts make it to this level. His Boy Scout Troop 390 in San Jose will be honoring him at a ceremony on March 27th. My wife and I are very proud of him and his accomplishments.